The recently discovered infrared-bright spot on Titan (see PIA07877) is the type of enigmatic feature that is best investigated by putting together as many different types of complementary information as possible. Cassini's varied array of scientific instruments is equal to the task. 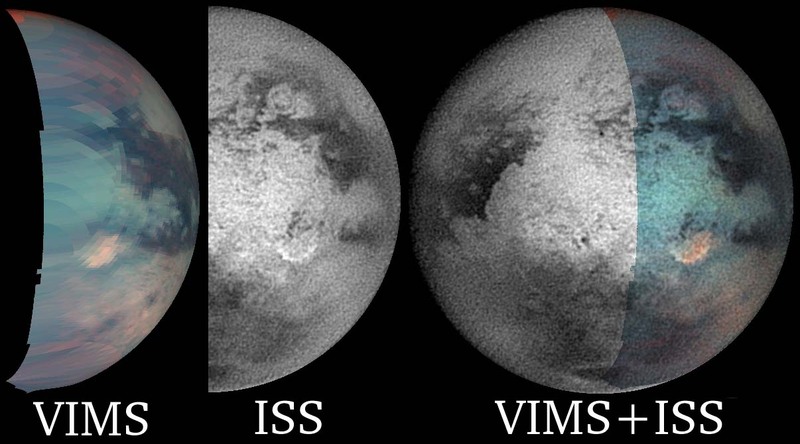 This montage shows the spot in infrared wavelengths from the visual and infrared mapping spectrometer on the left, from the imaging science subsystem in the center, and a combination of both data sets on the right. When put together, the two different views show more than either does separately. The visual and infrared spectrometer team noted the bright region in the image on the left after Cassini's March 31, 2004, Titan encounter. The strange, bright feature to the southeast of Xanadu (see PIA06154) was flagged as unusual and informally dubbed "The Smile" by imaging team members in December 2004. Together the images show that The Smile (seen by the imaging cameras at 0.938 micron) bounds the infrared "Bright, Red Spot" toward the southeast. The bright region seen in the visible and infrared mapping spectrometer image extends several hundred kilometers to the north and west of The Smile, but does not cover the dark terrain located between this area and Xanadu farther to the northwest. The Smile feature also seems to extend farther west at the south end than the Bright, Red Spot. 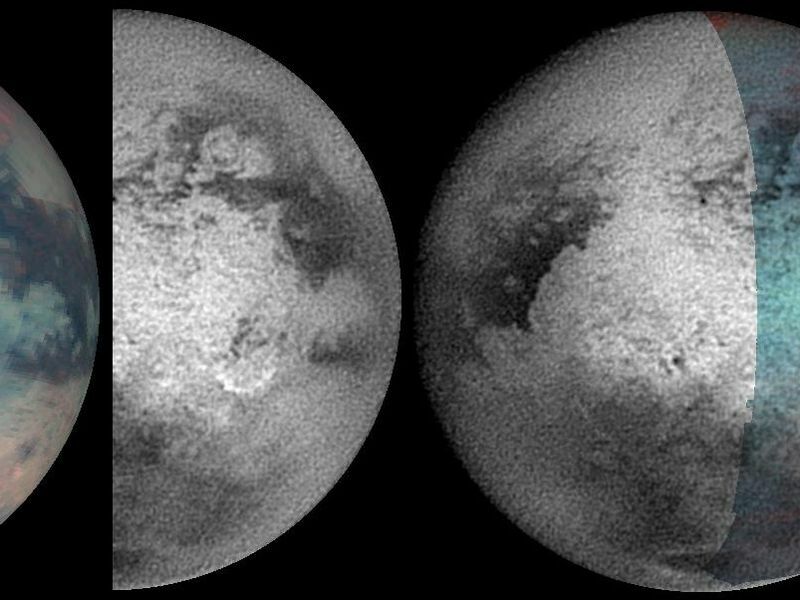 It seems clear that both instruments are detecting the same basic feature on Titan's surface. This bright patch may be due to an impact event, landslide, cryovolcanism, or atmospheric processes. Its distinct color and brightness suggest that it may have formed relatively recently. The false-color image on the left was created using images taken at 1.7 microns (represented by blue), 2.0 microns (green), and 5.0 microns (red). 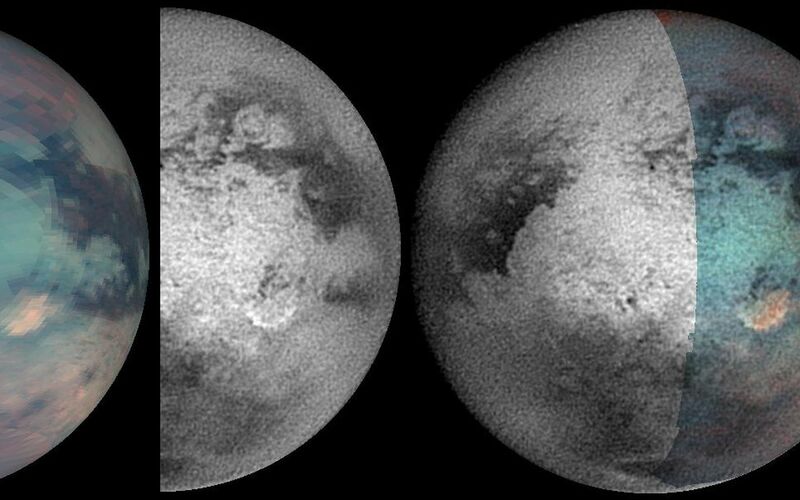 The images that comprise this view were taken by the visual and infrared mapping spectrometer instrument on the April 16, 2005, Titan flyby. Several views were stitched together to make a mosaic. The result was then reprojected to simulate the view from the imaging camera so that the two could be directly compared. The center image was taken by the narrow-angle camera on December 10, 2004, using a spectral filter centered at 0.938 microns (938 nanometers). The image was taken at a distance of 1.5 million kilometers from Titan and has a pixel scale of 9 kilometers (6 miles) per pixel (see PIA06154) for original image). The image is centered on 8 degrees south latitude, 112 degrees west longitude. This image has been contrast enhanced and sharpened to improve surface feature visibility. The Cassini-Huygens mission is a cooperative project of NASA, the European Space Agency and the Italian Space Agency. The Jet Propulsion Laboratory, a division of the California Institute of Technology in Pasadena, manages the mission for NASA's Science Mission Directorate, Washington, D.C. The Cassini orbiter and its two onboard cameras were designed, developed and assembled at JPL. The visual and infrared mapping spectrometer team is based at the University of Arizona. The imaging team is based at the Space Science Institute, Boulder, Colo.
For more information about the Cassini-Huygens mission visit http://saturn.jpl.nasa.gov. For additional images visit the VIMS page at http://wwwvims.lpl.arizona.edu and the Cassini imaging team homepage http://ciclops.org.